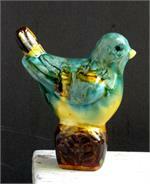 These bright birds are glazed in a bold transparent yellow. 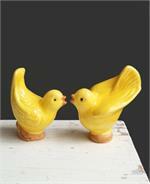 Featured on our Mother's Day postcard & email. 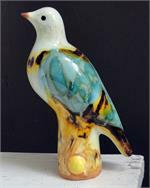 (Click on photo to see enlarged image.) 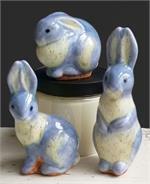 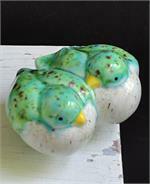 This is a pair of our popular holiday birds glazed in a marbled aqua glaze called Mermaid Blue. 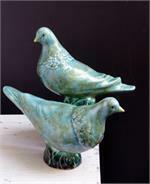 Their larger size makes a bold statement for a table top or mantel. 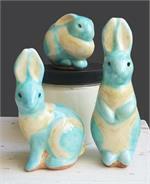 They are 10” long and about 6 inches tall. 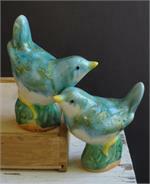 Beautiful Doves in one of our best selling colors. 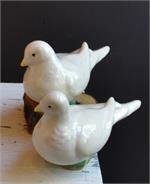 The doves are about 8-1/2 inches long- near life size. 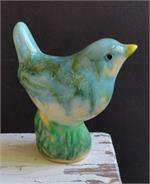 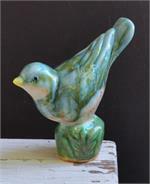 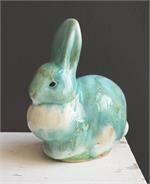 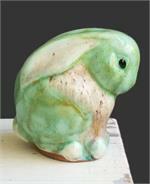 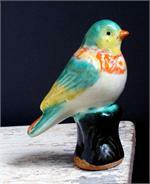 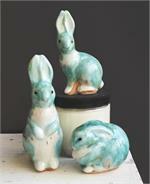 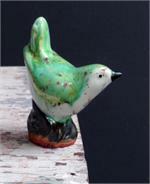 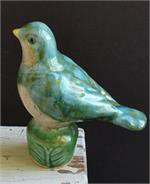 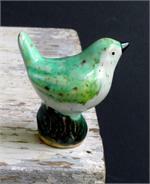 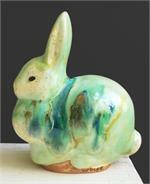 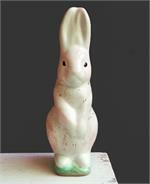 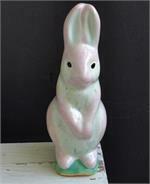 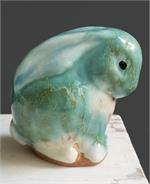 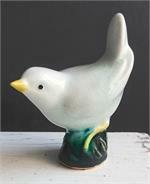 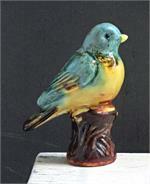 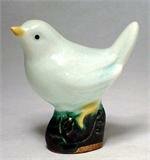 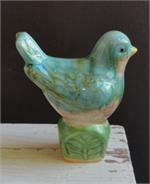 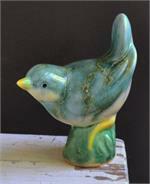 This wren is painted with Celadon, a glaze that has a crackled finish. 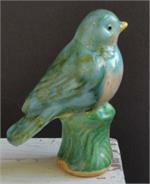 The cracked appearance of the glaze is intentional and gives it an antiqued look. 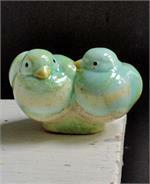 Our Lovebirds in a soft mint green with speckled cream accents. 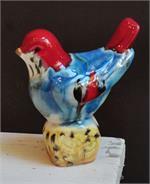 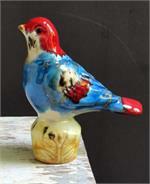 Bold Flame and Azure blue glazes on a festive summer Adi bird. 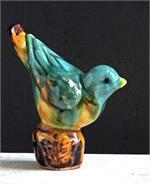 Bold Flame and Azure blue glazes on a festive summer Ivy Jane bird. 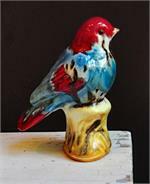 Bold Flame and Azure blue glazes on a festive summer Lucie bird. 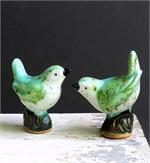 A pair of lovebirds decked out in bold flame and emerald glazes with a speckled underbelly. 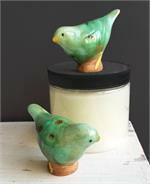 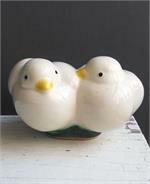 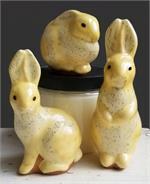 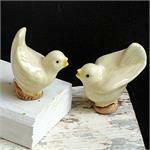 This is a pair of our popular holiday birds glazed in a soft creamy crackle glaze called Parchment. 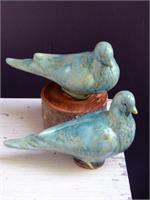 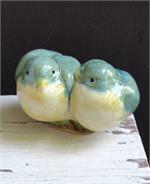 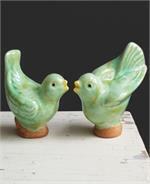 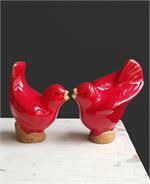 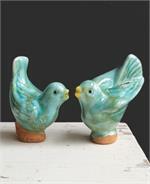 This big wren pair is glazed in a very pale crackle glaze. 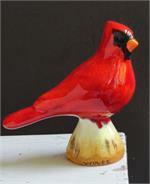 A new base color for our signature Large Cardinal. 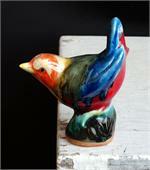 Our big wrens are two similar shapes in contrasting poses to make a dynamic set. 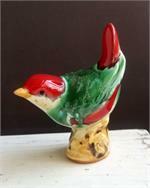 These particular birds are in festive flame and emerald glazes. 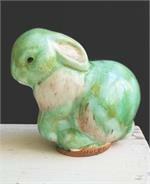 The white is a speckled crackle glaze. 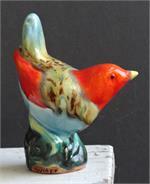 Our big wrens are two similar shapes in contrasting poses to make a dynamic set. 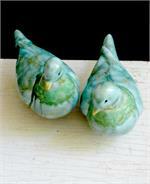 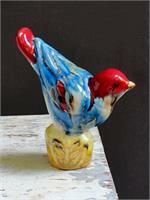 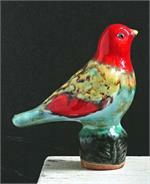 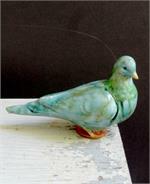 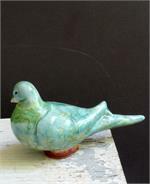 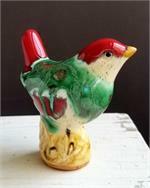 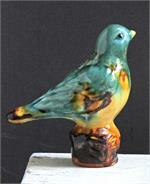 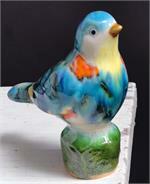 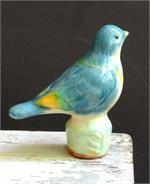 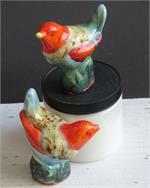 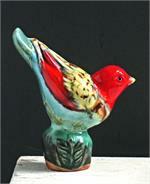 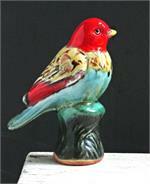 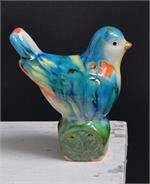 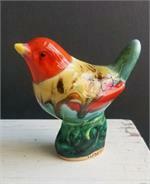 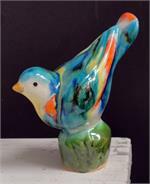 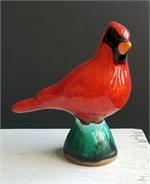 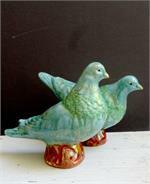 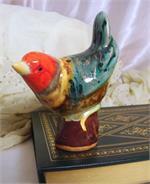 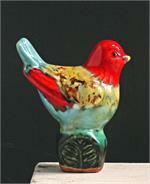 These particular birds are in festive flame and emerald glaze colors. 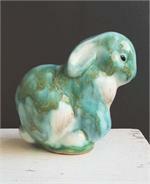 The white is a speckled crackle glaze. 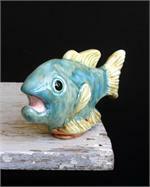 This fish is about 6 and a half inches long. 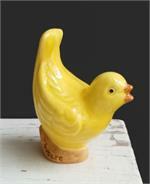 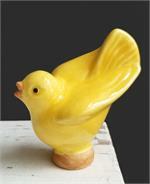 This is our popular Holiday Bird shape in a cheery translucent yellow.